Hello Quick Quotes Fans! Glad you joined us today, it's June here hosting the blog. I LOVE PowderPuff Chalking Inks. They are my "go to" colored ink for most techniques. 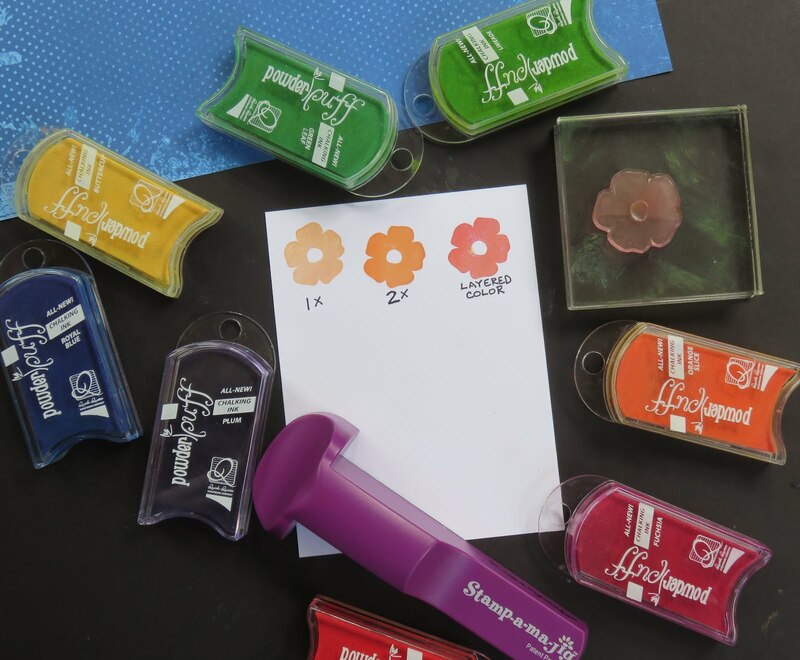 These inks come in a huge variety of BEAUTIFUL colors, blend effortlessly and stamp with amazing results. Check out today's card and see if you don't agree! The trick to getting rich, vibrant and all-over coverage on bold images is stamping twice. To accurately line up your stamps each time use a MISTI or Stamp-A-Ma-Jig. You can also customize your colors by layering different colors on top of each other. Stamp 3 large flowers, first with Fuchsia PowderPuff Ink, then layer Orange Slice PowderPuff Ink. Use Lipstick PowderPuff Ink for center detail. Fussy cut. 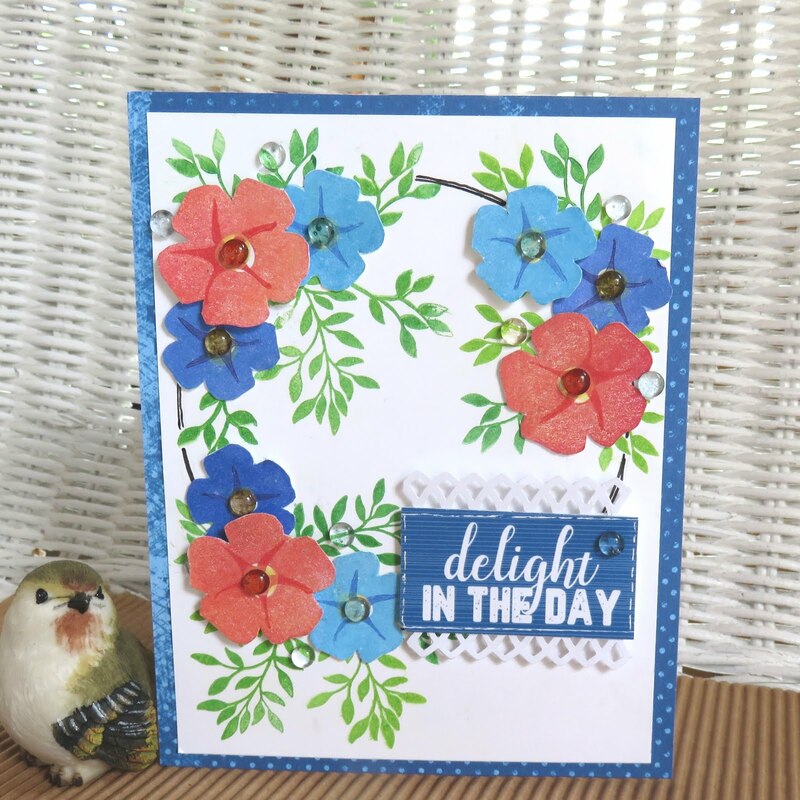 Stamp 3 small flowers, with Caribbean Blue PowderPuff Ink. Stamp each image twice for smooth coverage. Added center detail with Royal Blue PowderPuff Ink.Fussy cut. Stamp 3 small flowers, with Royal Blue PowderPuff Ink. Stamp each image twice for smooth coverage. Added center detail with Plum PowderPuff Ink.Fussy cut. Cut sentiment from Mulberry Quotes & Phrases and add border stripes to top and bottom. On 4" x 5-1/4" white cardstock, pencil in a 3-1/2" circle. 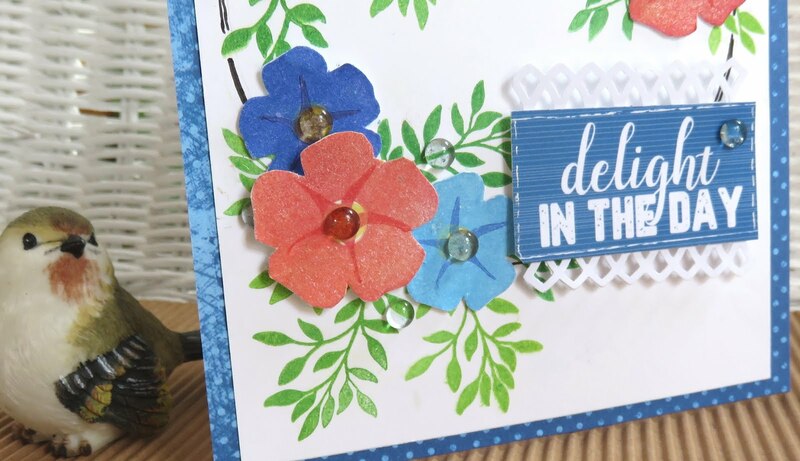 Stamp leaves along the circle using Green Leaf and Limade PowderPuff Inks. Attach flowers in 3 clusters, popping up a few. Attach sentiment with Foam Squares. Finish off with Dew Drops. Mat with 5-1/2" x 4-1/4" blue Mulberry paper (MB-103). Mulberry- 500 "Quotes and Phrases"
Thanks for stopping by and have fun playing with your PowderPuff Chalking Inks! I recently purchased the Misti, I will have to try this!